This isn't Christianity, it's an extreme form of Republican religionism. Moore’s base, on the other hand, continues to support him despite the evidence. For many of them, this is matter of faith. 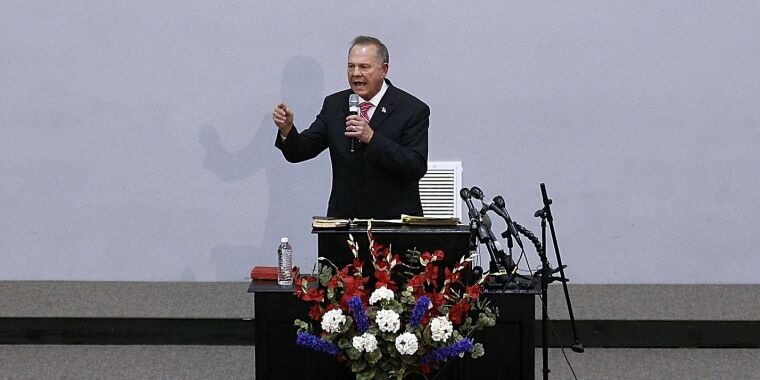 Jerome Cox, the pastor of Greenwood Baptist Church in Prattville, Alabama, told NBC News he would be supporting Moore because "he’s done a lot of good for the state of Alabama... Everything else is for the Lord to sort out." This is not Christianity. Rather, it is an extreme Republican religionism that stands by party and regressive policy no matter what. It's not the gospel of Christ, but a gospel of greed. It is the religion of racism and lies, not the religion of redemption and love. It is unlikely that any of Moore’s accusers can definitively prove that he sexually assaulted them 30 years ago (a point the defiant former judge knows well). But even before these allegations made national headlines, it was clear that Moore’s policy agenda endangered the children of Alabama and this nation. This man, who wants to be Alabama’s next Senator, wants to repeal Obamacare, making it health care inaccessible for millions, in Alabama and elsewhere. He has said Islam is a "false religion" homosexual conduct "should be illegal." and curtail equal protection under the law for gay and transgender people. Moore supports a tax plan that would hurt the poor and working poor. As one who survived abuse by a stranger in my own childhood, I feel deep empathy for the women who have come forward to name and confront their abuser. At the same time, my soul grieves as a Christian minister for people who are fed such a distorted view of Christianity and racism that they are willing to support Moore no matter what. I have heard the confessions of abusers: I know that people who are broken and hurting in their own souls hurt people and rally others to join them out of deep pain. But I am deeply troubled by Moore’s determination to wrap his own painful policies and pain-causing ways in the theological claim of being like Christ. There is nothing Christian about the policies Moore has supported. They are as immoral as the terrible abuse he so vehemently denies. While he wants to compare his plight to the suffering of Jesus, there is no biblical basis for policies that hurt poor people and children. As well as he knows his Bible, Roy Moore never quotes from the more than 2,000 verses that exhort us to care for the poor, the sick, and the stranger in our midst. He has apparently overlooked the prophet Isaiah, who said to men like Moore in his own day: “Doom to you who legislate evil, who make laws that make victims — laws that make misery for the poor, that rob the destitute of their dignity, exploiting defenseless widows, taking advantage of homeless children” (Is.10:1-4). National Republican leaders who claim the moral high ground while renouncing Moore now are like the Republicans who spoke out against white supremacy after Charlottesville, condemning the “hate” but never repenting of white nationalist policy. Their moral outrage rings hollow because it renounces Moore based on his personal patterns but says nothing about the disturbing pattern of his policy agenda. What is happening right now in Alabama matters for the soul of the nation. Anyone who has any influence must help blacks, progressive whites, and Latinos; gay and straight; Christians, Muslims, Jews, and all who want to move our country forward to get out and vote. This is no time to retreat or remain idle. We must stand up for truth in the public square and reclaim our political and faith traditions which have been hijacked. The Rev. 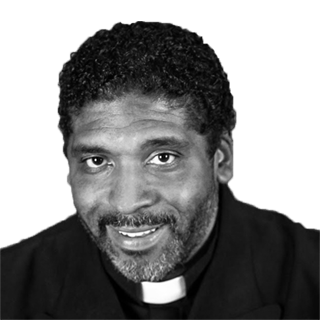 Dr. William J. Barber, II, is Senior Pastor of Greenleaf Christian Church, President and Senior Lecturer at Repairers of the Breach, and Co-Chair of the Poor People's Campaign: A National Call for Moral Revival. He is the author The Third Reconstruction (Beacon Press).